Has to come top of my list as this jacket goes everywhere with me. It's warm, practical and can pack down light into my bag when I'm not wearing it. Being a fan of wearing bright colours, this jacket also ticks that box for me too. I've had this for over 3 years and can firmly say it's worth every penny. When I'm out on a long bike ride I need something I can rely on to keep me warm and dry. I love how fitted this jacket is and that it's small enough to fit into my jersey pocket when I don't need it. The quality is second to none and it's kept me dry through long, wet rides so definitely a must-have on my cycling kit list. I'll certainly be wearing this on the Rapha Women's 100 on 20th July, join in here! The last few years have seen huge developments in women's fitness fashion and I'm loving it. Their marketing is working and I've started to buy more exercise clothing. I find that if I feel good I train harder. This outfit from Nike totally tops my list and I'm sure you'll understand why. Did I mention I love bright colours? Nike has a fantastic women's range and is very reasonable. It was love at first sight with these leggings and the top is so comfortable and versatile I couldn't resist. To top off the outfit, my NikeIDs were customised by me, so I chose all the colours, patterns and even popped my name on the tongue of the shoe. J'adore! Having a good merino wool neckgaiter and a snug beanie have been my lifesavers many a time whilst out climbing, cycling or hiking. It's amazing how much warmth and comfort you can get from two items that are so small. Arcteryx offers top of the range mountaineering clothing and accessories so was an obvious choice when buying these. Alright, I'll admit it... It took me a good few years of cycling before I bought myself a pair of arm warmers. I simply didn't believe the hype about how good they were. They seemed like one more accessory I 'had to have' if I was to be a cyclist. Add it to the list of accessories such as bike computer, cleats, cycling shoes, booties and you may as well wash your pay check down the sink. HOWEVER, these are as good as they claim to be! 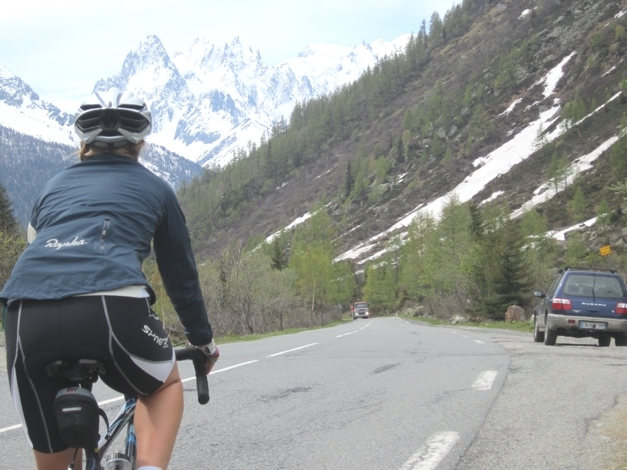 It's like wearing an extra layer of clothing, they keep you so warm but also give the flexibility to strip off and store in your cycling jersey which you couldn't do with another layer. The Rapha ones are my fav because they are fleecy and soft on the inside as well as very well made, highly recommended. I run, cycle, climb, hike and recover in these leggings. I have both a thermal and regular pair so I'm pretty much covered for all outdoor eventualities! Have had them both for over four years and still work as good as new. They are fitted and very comfortable for doing sports in, they aid recovery and help avoid injury by increasing circulation and reducing build up of lactic acid. Winner. I bought these the day before Ironman Wales and now wear them after all my endurance events. They work in the same way as the tights and aid recovery by helping the blood flow back into your muscles. Think of it as a mini sports massage. I don't go anywhere without my merino wool baselayer. Again, I wear it for all outdoor sports underneath all my other layers. They are a total must-have for me because they never feel wet and clingy with sweat, they wick away the moisture from the skin and absorb it so the skin can stay dry. You can wear them for days without them starting to smell and they're very comfortable. Big love for these. Probably the least practical out of my top ten items, but wins on comfort. This is perfect for all those times when I want to feel warm, comfortable and cosy like a bear. This fluffy fleece offers instant warmth which is something I really need and look forward to at the end of a race or adventure. Everyone's got their favourite cycling jersey, right? 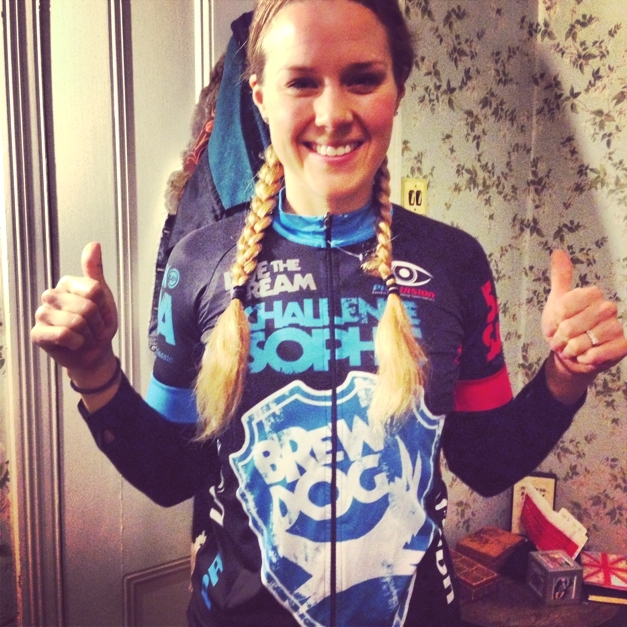 Being sponsored by BrewDog means I could design an awesome and totally unique Challenge Sophie - BrewDog cycling jersey, wear it with pride and earn my beers! What's on your top ten kit list, which items could you not live without? When I first began getting into all these outdoor sports I remember feeling overwhelmed by the price and quantity of items I felt I needed. Between cycling, triathlon, climbing and general outdoor adventure, I may well have picked some of the most expensive and kit intensive sports. Running would have been a good option - shoes, shorts, top - job done! As I began learning to climb, cycle and dabble in adventure sports, I found myself in a world where a pair of mountaineering boots costs upwards of £300, a jacket £250+, bike £1000+ and cycling shoes £150+. Not to mention technical climbing equipment, ice axes, ropes, a wetsuit - the list goes on... daunting to say the least! Try not to get overwhelmed by the expensive items on sale, it's not all about the kit but about you and what you do in the outdoors. Of course, I didn't need to have all this kit straight away, and this is the important part... It's tempting to feel we need the latest kit, or we need to have the full rack of climbing hardware, but the reality is we don't need it all right away. My advice to anyone new to these sports is to borrow, share or find hand-me-downs from friends as you gradually build up your collection. I had an oversized red Berghaus jacket that my friend Eddie gave me and I wore it for all my adventures. I wore it adventuring racing in Borneo, on the 3 Peaks Challenge, mountaineering in Scotland, on my Alpine Apprenticeship in Switzerland and whilst climbing Mont Blanc.